Dianara v1.2.0 is out the door! It’s been three months since I released the 1.1 version of my pump.io client, Dianara, so it’s about time for 1.2! Only this time, I’ve added a ‘bugfix’ digit too, so it’s 1.2.0. Next release will be a 1.2.1, with smaller changes, and hopefully sooner. Anyway, here it is, Dianara 1.2.0! The main window. Some stuff is green and blue due to highlighting rules. Colors are configurable, of course. The main changes in this version are the possibility of editing (modifying) your comments, enhanced filters, which now apply to the timelines too, and can highlight activities in addition to hiding them, using some nice colors, the ability to search the contact lists, and the “avatar buttons” everywhere, with several options for the contact. There is an audio and video uploading capability in the works, but I’ve disabled it for this version, mainly because the feature was quite incomplete. Ability to search the contact list by partial name or address. Filters have been extended to be used in the timelines too, and can also be set to *highlight* posts, in addition to hiding them. Nicer avatars-buttons with options are used everywhere now. Meanwhile items such as “someone followed someone else”, also have an avatar-button for that person, with the usual options. ‘Meanwhile’ item highlighting uses different, customizable colors. These are also used in the Timeline posts, where appropriate. More information in Meanwhile tooltips. Fuzzy timestamps, like “3 minutes ago” are updated every minute. Post of type ‘audio’, ‘video’ and ‘file’ are shown in a basic manner. Video/Audio upload mostly works but has been disabled for this release. More keyboard control for timelines (Ctrl+Up/Down/PgUp/PgDown/Home/End). 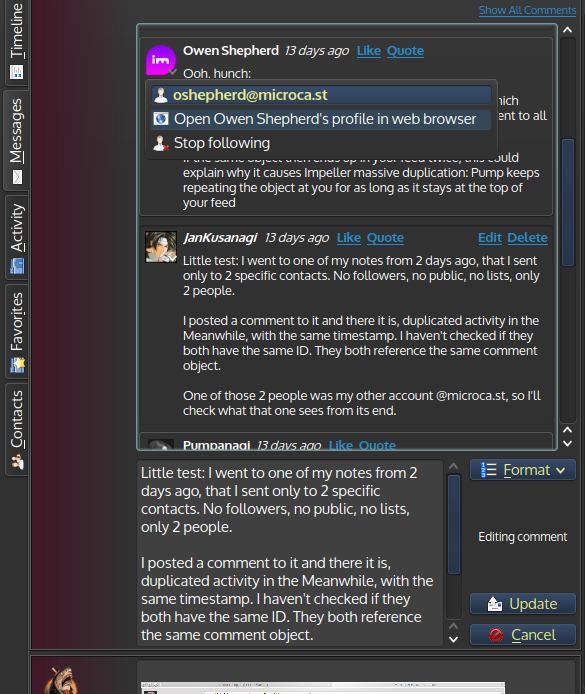 Quoting partial comments (selected text) now works, though it has issues. Info about a hovered URL in posts and comments is now shown in the status bar. New contacts are added to the lists without the need to fully reload them after following or unfollowing someone. Several enhancements in the Image Viewer. Added some fallback icons, to be used when the system iconset doesn’t have an appropriate icon. Disable some menus and widgets until Dianara is authorized to use an account. Dianara 1.2.0 is available in English, Catalan, Spanish and Italian languages. There is a Polish translation in the works. 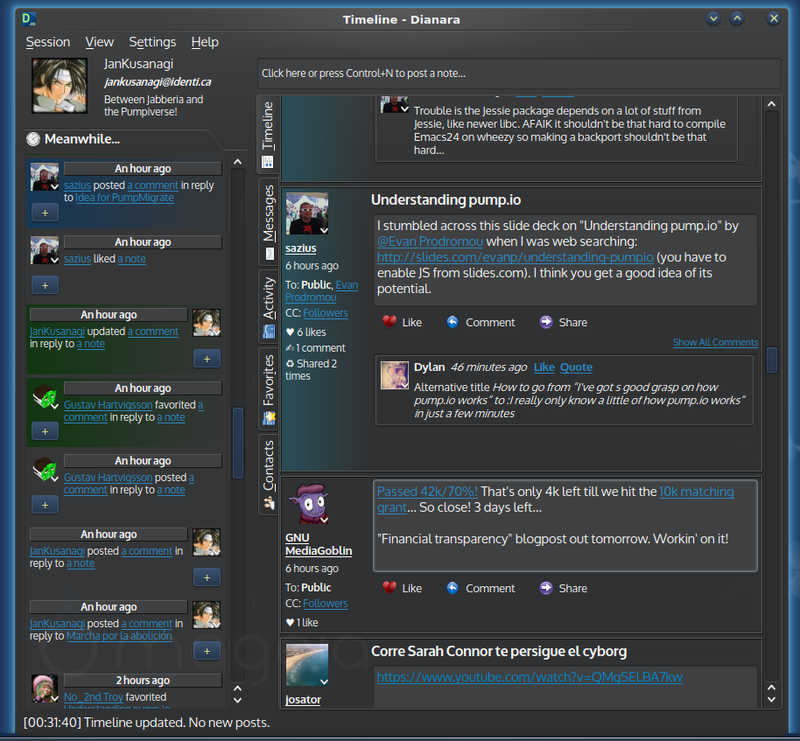 Dianara is available in the repositories of several GNU/linux distributions. At this time, at least Debian Testing/Sid, Mageia 4, Chakra, Ubuntu 13.10 and KaosX. You can find Fedora packages at Metal Biker’s repo (who also translated it to Italian!). Also, a fellow pumper, LuisGF, has been able to provide builds of Dianara for MSwindows. Check the INSTALL file for details on how to build it and the necessary dependencies. You are currently browsing the Jan+KDE blog archives for April, 2014.